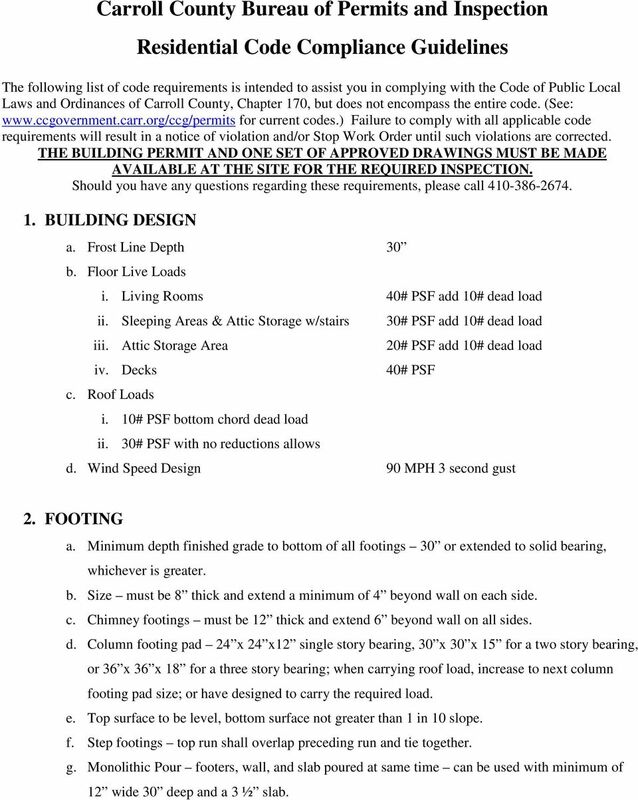 Download "Carroll County Bureau of Permits and Inspection Residential Code Compliance Guidelines"
1 Carroll County Bureau of Permits and Inspection Residential Code Compliance Guidelines The following list of code requirements is intended to assist you in complying with the Code of Public Local Laws and Ordinances of Carroll County, Chapter 170, but does not encompass the entire code. (See: for current codes.) Failure to comply with all applicable code requirements will result in a notice of violation and/or Stop Work Order until such violations are corrected. THE BUILDING PERMIT AND ONE SET OF APPROVED DRAWINGS MUST BE MADE AVAILABLE AT THE SITE FOR THE REQUIRED INSPECTION. Should you have any questions regarding these requirements, please call BUILDING DESIGN a. Frost Line Depth 30 b. Floor Live Loads i. Living Rooms 40# PSF add 10# dead load ii. Sleeping Areas & Attic Storage w/stairs iii. Attic Storage Area iv. Decks c. Roof Loads i. 10# PSF bottom chord dead load ii. 30# PSF with no reductions allows 30# PSF add 10# dead load 20# PSF add 10# dead load 40# PSF d. Wind Speed Design 90 MPH 3 second gust 2. FOOTING a. Minimum depth finished grade to bottom of all footings 30 or extended to solid bearing, whichever is greater. b. Size must be 8 thick and extend a minimum of 4 beyond wall on each side. c. Chimney footings must be 12 thick and extend 6 beyond wall on all sides. d. Column footing pad 24 x 24 x12 single story bearing, 30 x 30 x 15 for a two story bearing, or 36 x 36 x 18 for a three story bearing; when carrying roof load, increase to next column footing pad size; or have designed to carry the required load. e. Top surface to be level, bottom surface not greater than 1 in 10 slope. f. Step footings top run shall overlap preceding run and tie together. g. Monolithic Pour footers, wall, and slab poured at same time can be used with minimum of 12 wide 30 deep and a 3 ½ slab. 2 3. FOUNDATION WALLS a. Top course of block shall be a solid unit or filled solid. b. Top of wall at least 6 above grade. c. Wall thickness according to depth of backfill. Maximum backfill for 8 hollow block 4, for 10 block 5, for 12 block 6. The Code Official, when soil conditions warrant, may decrease the amount of backfill allowed or ask for an engineer s report. d. Plate anchors approved straps shall be spaced and installed per manufacturer s instruction. ½ bolts at maximum 6 on center, 7 into masonry and a maximum 12 from corners. e. Where walls of masonry hollow units or masonry bonded hollow walls are decreased in thickness, a course of solid masonry shall be constructed between wall below and the thinner wall above. f. Masonry stem wall construction shall be installed in accordance with code. 4. FOUNDATION DRAINAGE, WATER PROOFING a. Drain tile perforated = 3 minimum diameter or approved drainage system with ICC ES report. Installed on the exterior perimeter of walls where interior grade is below exterior grade. b. Tile surrounded by 4 gravel and covered with approved filter material. c. Drain tile shall discharge to a sealed sump pit, which contains a pump or provides gravity flow to grade, discharging a minimum of 10 from house and 10 from property line. d. Areaway drain tied to sealed sump pit or positive gravity flow with 2 pipe with minimum ¼ 1 0 slope or 3 pipe with minimum 1 / e. The exterior of masonry walls enclosing basements below grade to be parged with 3 / 8 portland cement coved at bottom and covered with an approved waterproofing. f. Poured concrete walls enclosing areas below grade must have wall ties broken off flush with face and covered with an approved waterproofing. 5. HOUSE SUPPORT COLUMNS a. All supporting post or columns shall be anchored top and bottom. b. Adjustable columns screw down anchored in concrete to prevent lateral displacement. c. All surfaces of steel columns shall be given a shop coat of rust inhibitive paint. d. Column spacing reference Beam Spans. e. Column footings See Section 2 d. 6. PROTECTION AGAINST DECAY a. Pressure treated sill plates less than 8 from finished grade. b. All wood in contact with earth or in contact with concrete must be pressure treated. 3 c. Wood beams pocketed in masonry wall ½ clearance, sides and end. Beam bottom shall not be in direct contact with masonry. d. Wood joists or bottom of wood structural floor when closer than 18 or wood girders when closer than 12 to exposed ground must be pressure treated. e. Sills and sleepers on a concrete or masonry slab in direct contact with ground must be pressure treated, unless separated from such slab by an impervious moisture barrier. f. Siding, sheathing, wall framing on exterior less than 6 from ground shall be pressure treated wood, or protected in an approved manner. g. Wood furring strips or other wood framing members attached directly to the interior of the exterior masonry walls or concrete wall below grade except where an approved vapor retardant is applied between the wall and the furring strips or framing members. h. All wood in contact with the ground and supports permanent structures shall be treated lumber. i. All fasteners for pressure treated wood shall be hot-dipped, zinc-coated, galvanized, stainless steel, silicon bronze, or copper. 7. CRAWL SPACE a. Access to all under-floor spaces. Opening through the floor shall be a minimum of 18 x 24 ; openings through a perimeter wall shall be not less than 16 x 24. b. Ventilation of crawl space 1 sq. ft. of area per 150 sq. ft. One opening within 3 of each corner. c. Provide drain tile when the grade under the floor is lower than the outside finished grade. d. A radon system shall be installed in accordance with Appendix F of the International Residential Code and labeled with a continuous orange paint line throughout the structure. e. The exterior of masonry walls enclosing basements below grade to be parged with 3 / 8 portland cement coved at bottom and covered with an approved waterproofing. f. Poured concrete walls enclosing areas below grade must have wall ties broken off flush with face and covered with an approved waterproofing. 8. WALL CONSTRUCTION a. Bearing walls interior and exterior. Double top plate. Exception: Single top plate may be installed in bearing and exterior walls, provided the plate is adequately tied at joints, corners, and intersecting walls by at least the equivalent of 3 by 6 by thick galvanized steel that is nailed to rack wall or segment of wall by three 8d nails or equivalent, provided the rafters or joists are centered over the studs with a tolerance of no more than 1. b. Interior load-bearing partitions shall be constructed and fire stopped as exterior walls. c. Interior non-bearing partitions may be constructed with 2 x 3 studs spaced 16 on center or 2 x 4 studs spaced 24 on center, where not needed as a braced wall line. 4 d. Firestop all concealed spaces of stud wall partitions to cut off all concealed draft opening and to form an effective fire barrier between stories and roof. e. Buildings shall be braced in accordance with the code or engineered design. f. Studs shall be continuous from floor/foundation to ceiling or roof assembly. g. All header and beam spans shall be installed in accordance with the code or designed in accordance with accepted engineering practices. 9. 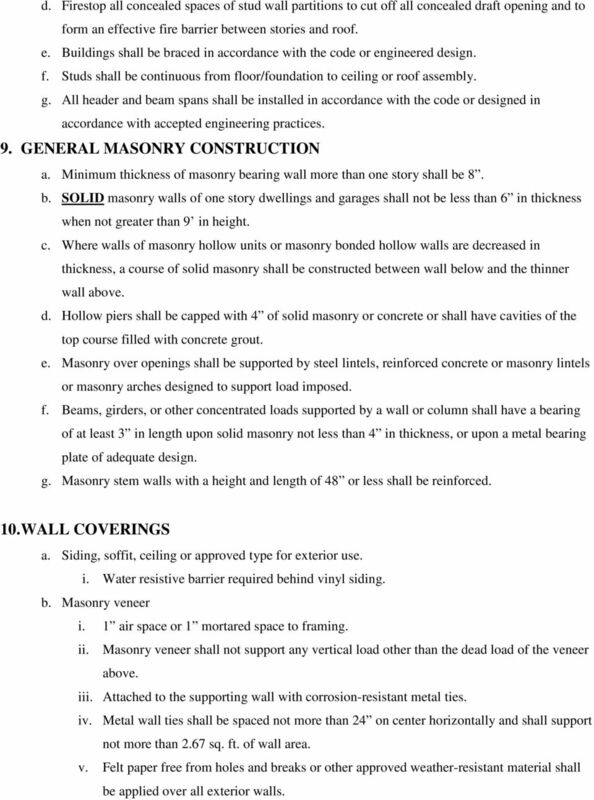 GENERAL MASONRY CONSTRUCTION a. Minimum thickness of masonry bearing wall more than one story shall be 8. b. SOLID masonry walls of one story dwellings and garages shall not be less than 6 in thickness when not greater than 9 in height. c. Where walls of masonry hollow units or masonry bonded hollow walls are decreased in thickness, a course of solid masonry shall be constructed between wall below and the thinner wall above. d. Hollow piers shall be capped with 4 of solid masonry or concrete or shall have cavities of the top course filled with concrete grout. e. Masonry over openings shall be supported by steel lintels, reinforced concrete or masonry lintels or masonry arches designed to support load imposed. f. Beams, girders, or other concentrated loads supported by a wall or column shall have a bearing of at least 3 in length upon solid masonry not less than 4 in thickness, or upon a metal bearing plate of adequate design. g. Masonry stem walls with a height and length of 48 or less shall be reinforced. 10. WALL COVERINGS a. Siding, soffit, ceiling or approved type for exterior use. i. Water resistive barrier required behind vinyl siding. b. Masonry veneer i. 1 air space or 1 mortared space to framing. ii. Masonry veneer shall not support any vertical load other than the dead load of the veneer above. iii. Attached to the supporting wall with corrosion-resistant metal ties. iv. Metal wall ties shall be spaced not more than 24 on center horizontally and shall support not more than 2.67 sq. ft. of wall area. v. Felt paper free from holes and breaks or other approved weather-resistant material shall be applied over all exterior walls. 5 vi. Flashing for masonry veneer shall be located beneath the first course of masonry above finished ground level above the foundation wall or slab. vii. Weep holes shall be provided in the outside wythe of masonry walls at a maximum spacing of 33 on center, not less than 3 / 16 in diameter. viii. Flashing shall be used around windows and doors, under and at the ends of masonry, above all projecting, wood trim, where porches, decks, or stairs attached to a wall or floor assembly, all wall and roof intersections. 11. FLOOR SYSTEMS a. Joist minimum bearing on: wood 1 ½, masonry 3. b. Joist hangers or lapped minimum 3 over beam. 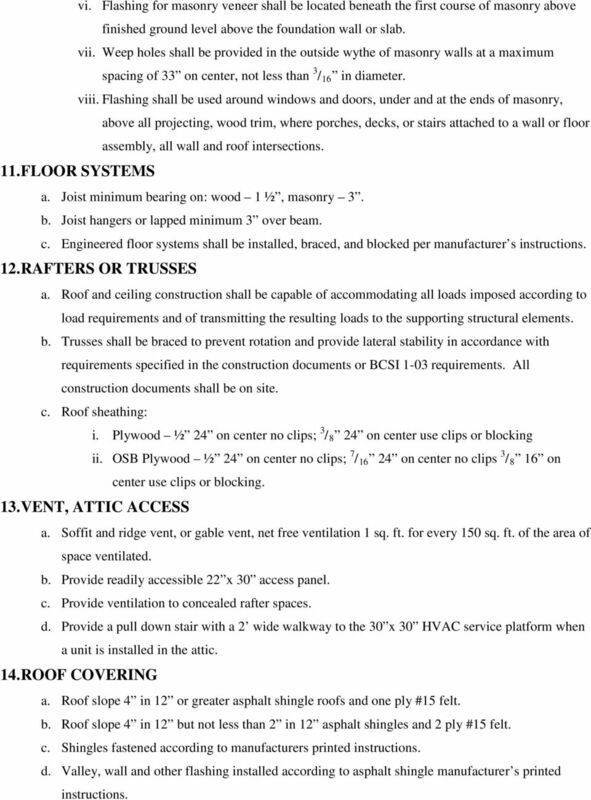 c. Engineered floor systems shall be installed, braced, and blocked per manufacturer s instructions. 12. RAFTERS OR TRUSSES a. Roof and ceiling construction shall be capable of accommodating all loads imposed according to load requirements and of transmitting the resulting loads to the supporting structural elements. b. Trusses shall be braced to prevent rotation and provide lateral stability in accordance with requirements specified in the construction documents or BCSI 1-03 requirements. All construction documents shall be on site. c. Roof sheathing: i. Plywood ½ 24 on center no clips; 3 / 8 24 on center use clips or blocking ii. OSB Plywood ½ 24 on center no clips; 7 / on center no clips 3 / 8 16 on center use clips or blocking. 13. VENT, ATTIC ACCESS a. Soffit and ridge vent, or gable vent, net free ventilation 1 sq. ft. for every 150 sq. ft. of the area of space ventilated. b. Provide readily accessible 22 x 30 access panel. c. Provide ventilation to concealed rafter spaces. d. Provide a pull down stair with a 2 wide walkway to the 30 x 30 HVAC service platform when a unit is installed in the attic. 14. ROOF COVERING a. Roof slope 4 in 12 or greater asphalt shingle roofs and one ply #15 felt. b. Roof slope 4 in 12 but not less than 2 in 12 asphalt shingles and 2 ply #15 felt. c. Shingles fastened according to manufacturers printed instructions. d. Valley, wall and other flashing installed according to asphalt shingle manufacturer s printed instructions. 6 15. CONCRETE FLOORS a. Concrete slab on grade: 3 ½ minimum thickness, compressive strength 2500 SPI, 4 thick stone sub-base. b. Fill shall be free of vegetation and foreign material and compacted to assure uniform support, fill should not exceed 24. c. 6 mil vapor barrier with joints lapped not less than 12 between the concrete floor slab and the base course. Vapor barrier may be omitted from; detached garages, utility buildings, and other unheated structures; driveways, walks, patios, and other flat areas. d. Slab with floor levels less than 12 below grade shall have R-10 insulation installed in accordance with the International Energy Code. e. A radon system shall be installed in accordance with Appendix F of the International Residential Code and labeled with a continuous orange paint line throughout the structure. 16. CHIMNEY & FIREPLACES a. 4 solid masonry around flue liner with ½ air space surrounding flue. b. 8 solid masonry without flue liner. c. Chimney clearance to combustible 2 interior and/or 1 exterior. d. Firestopped at floors, ceilings and roofs. e. Top of chimney shall extend at least 2 above any portion of the building within 10 but shall not be less than 3 above the point where it passes through the roof. f. Provide chimney crickets when dimension parallel to ridgeline is greater than 30 and does not intersect the ridgeline. g. Hearths shall extend a minimum 20. Extensions shall be 16 for fireboxes with less than 6 sq. ft. and 20 for fireboxes greater than 6 sq. ft. Wood burning fireplace shall have gasket doors installed. h. Cleanout openings, when provided, shall be equipped with ferrous metal doors and frames constructed to remain tightly closed, except when in use. i. Cleanout openings are optional, except when woodstoves are to be connected to masonry chimneys. When provided, they shall be equipped with ferrous metal doors and frames arranged to remain tightly closed when not in use. Cleanout openings shall be located not less than 2 6 below the lowest inlet to the flue. 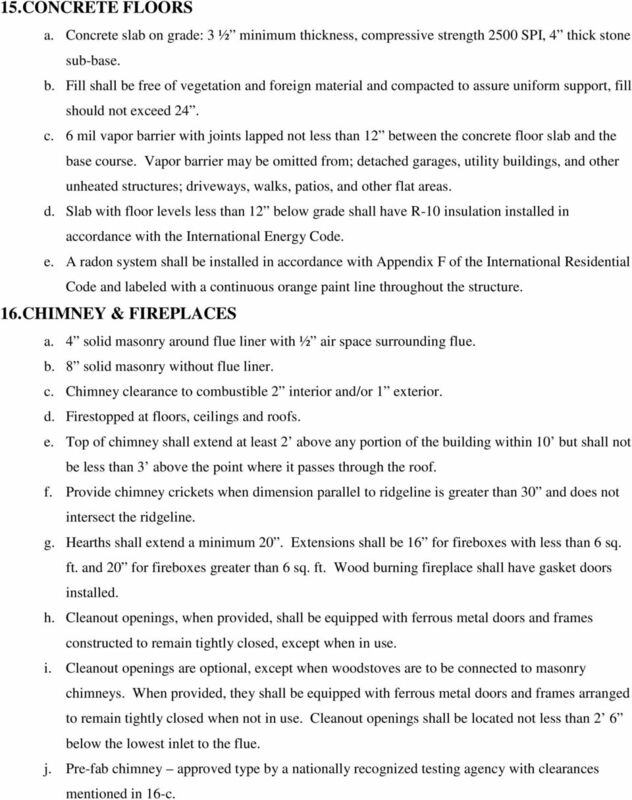 j. Pre-fab chimney approved type by a nationally recognized testing agency with clearances mentioned in 16-c.
7 17. LIGHT, VENTILATION AND HEATING a. Basement 2% of floor area including door infiltration. 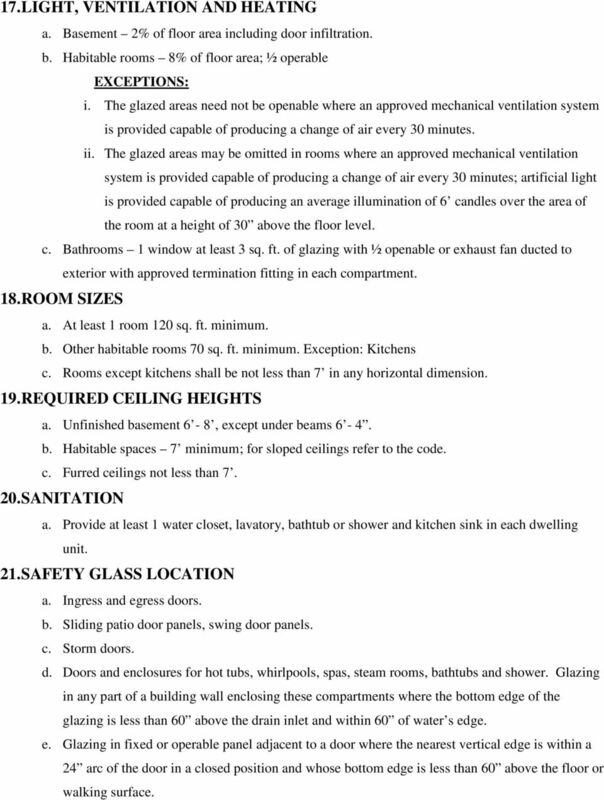 b. Habitable rooms 8% of floor area; ½ operable EXCEPTIONS: i. The glazed areas need not be openable where an approved mechanical ventilation system is provided capable of producing a change of air every 30 minutes. ii. The glazed areas may be omitted in rooms where an approved mechanical ventilation system is provided capable of producing a change of air every 30 minutes; artificial light is provided capable of producing an average illumination of 6 candles over the area of the room at a height of 30 above the floor level. c. Bathrooms 1 window at least 3 sq. ft. of glazing with ½ openable or exhaust fan ducted to exterior with approved termination fitting in each compartment. 18. ROOM SIZES a. At least 1 room 120 sq. ft. minimum. b. Other habitable rooms 70 sq. ft. minimum. Exception: Kitchens c. Rooms except kitchens shall be not less than 7 in any horizontal dimension. 19. REQUIRED CEILING HEIGHTS a. 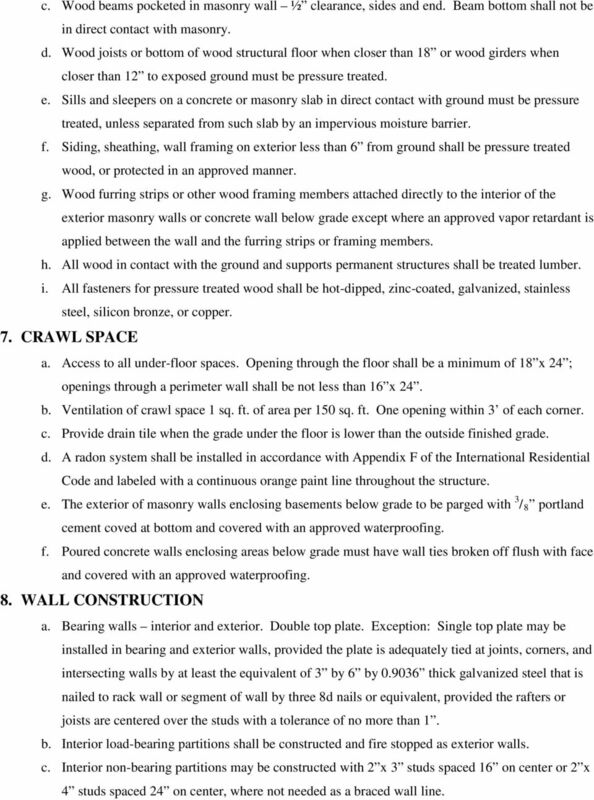 Unfinished basement 6-8, except under beams 6-4. b. Habitable spaces 7 minimum; for sloped ceilings refer to the code. c. Furred ceilings not less than SANITATION a. Provide at least 1 water closet, lavatory, bathtub or shower and kitchen sink in each dwelling unit. 21. SAFETY GLASS LOCATION a. Ingress and egress doors. b. Sliding patio door panels, swing door panels. c. Storm doors. d. Doors and enclosures for hot tubs, whirlpools, spas, steam rooms, bathtubs and shower. Glazing in any part of a building wall enclosing these compartments where the bottom edge of the glazing is less than 60 above the drain inlet and within 60 of water s edge. e. Glazing in fixed or operable panel adjacent to a door where the nearest vertical edge is within a 24 arc of the door in a closed position and whose bottom edge is less than 60 above the floor or walking surface. 8 f. Windows greater than 9 sq. ft. and bottom edge less than 18 above floor; top edge greater than 36 above floor. One or more walking surfaces within 36 horizontally of the glazing. g. Stairs. 22. ATTACHED GARAGE a. Separated from residence and its attic by means of ½ drywall on garage side. b. Garage between habitable rooms shall be separated from habitable rooms above with 5 / 8 type X drywall and walls supporting such structure with ½ drywall. c. Door between house and garage, not into sleeping quarters, 1-3 / 8 solid core or 20 minute fire rated doors or equivalent, self closer. d. Floor, non-combustible, sloped towards the main vehicle entry doorway or a drain. 23. EXIT REQUIREMENTS a. At least 1 exit door shall be provided for each dwelling unit. The door shall be side hinged and shall provide a minimum clear width of 32 when measured between the face of the door and the stop with the door open at 90 degrees. b. Basement, habitable attics and every sleeping room shall have at least one door exit or window with a net clear opening of 5.7 sq. ft. with a minimum open width of 20, a minimum open height of 24, and a maximum sill height from floor of 44. Exception, ground floor windows net clear opening reduced to 5.0 sq. ft. NOTE: minimum open width of 20 and minimum open height of 24 will not produce 5.7 sq. ft. of net clear opening. Clear opening width in inches x clear opening height in inches = 820 sq. inches. c. Bars, grills, and screens or other obstructions placed over emergency escape windows shall be releasable from the inside without the use of a key or tool. d. Lock or latch on all egress doors shall be readily openable from the side from which egress is to be made without the use of a key. 24. LANDINGS a. Minimum 3 x 3 landing shall be required on each side of egress doors. The floor or landing shall not be more than 1 ½ lower than top of the threshold. EXCEPTIONS: i. At top of interior stairs, provided door does not swing over stairs. ii. 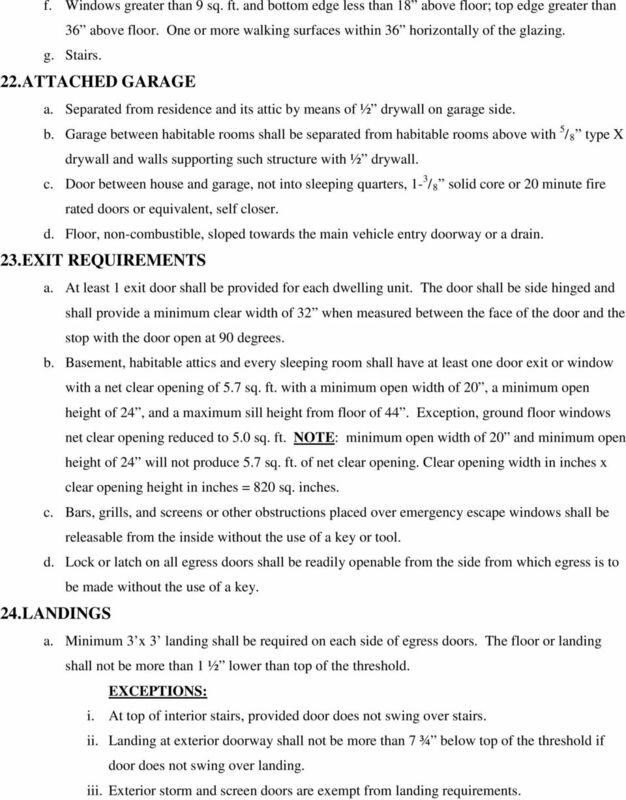 Landing at exterior doorway shall not be more than 7 ¾ below top of the threshold if door does not swing over landing. iii. Exterior storm and screen doors are exempt from landing requirements. 9 25. STAIRS a. Width minimum 36 above handrail height and below the required headroom height. b. Minimum width at and below handrail height is 32. c. Minimum tread is 10 nose to nose. Maximum riser is 7 ¾ top of tread to top of tread. d. The greatest tread or riser height within any flight of stairs shall not exceed the smallest by more than 3/8. 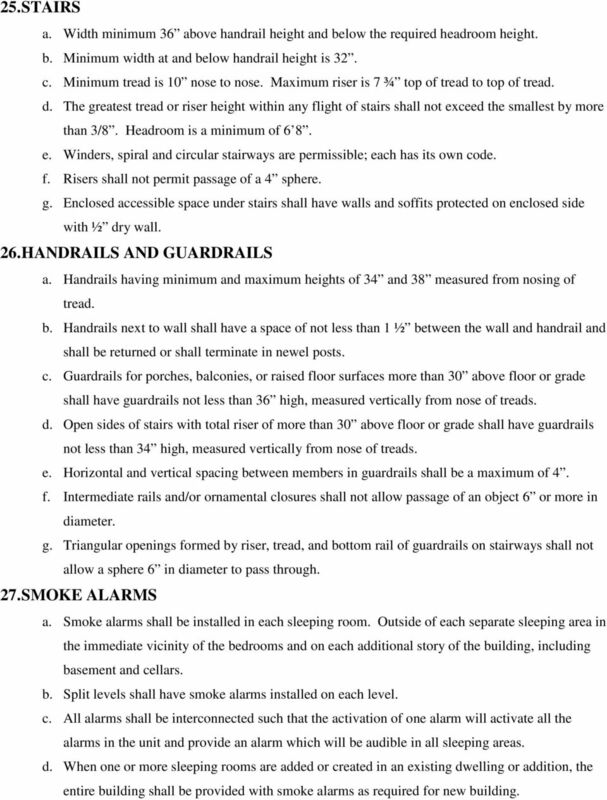 Headroom is a minimum of 6 8. e. Winders, spiral and circular stairways are permissible; each has its own code. f. Risers shall not permit passage of a 4 sphere. g. Enclosed accessible space under stairs shall have walls and soffits protected on enclosed side with ½ dry wall. 26. HANDRAILS AND GUARDRAILS a. Handrails having minimum and maximum heights of 34 and 38 measured from nosing of tread. b. Handrails next to wall shall have a space of not less than 1 ½ between the wall and handrail and shall be returned or shall terminate in newel posts. c. Guardrails for porches, balconies, or raised floor surfaces more than 30 above floor or grade shall have guardrails not less than 36 high, measured vertically from nose of treads. d. Open sides of stairs with total riser of more than 30 above floor or grade shall have guardrails not less than 34 high, measured vertically from nose of treads. e. Horizontal and vertical spacing between members in guardrails shall be a maximum of 4. f. Intermediate rails and/or ornamental closures shall not allow passage of an object 6 or more in diameter. g. Triangular openings formed by riser, tread, and bottom rail of guardrails on stairways shall not allow a sphere 6 in diameter to pass through. 27. SMOKE ALARMS a. Smoke alarms shall be installed in each sleeping room. Outside of each separate sleeping area in the immediate vicinity of the bedrooms and on each additional story of the building, including basement and cellars. b. Split levels shall have smoke alarms installed on each level. c. All alarms shall be interconnected such that the activation of one alarm will activate all the alarms in the unit and provide an alarm which will be audible in all sleeping areas. d. When one or more sleeping rooms are added or created in an existing dwelling or addition, the entire building shall be provided with smoke alarms as required for new building. 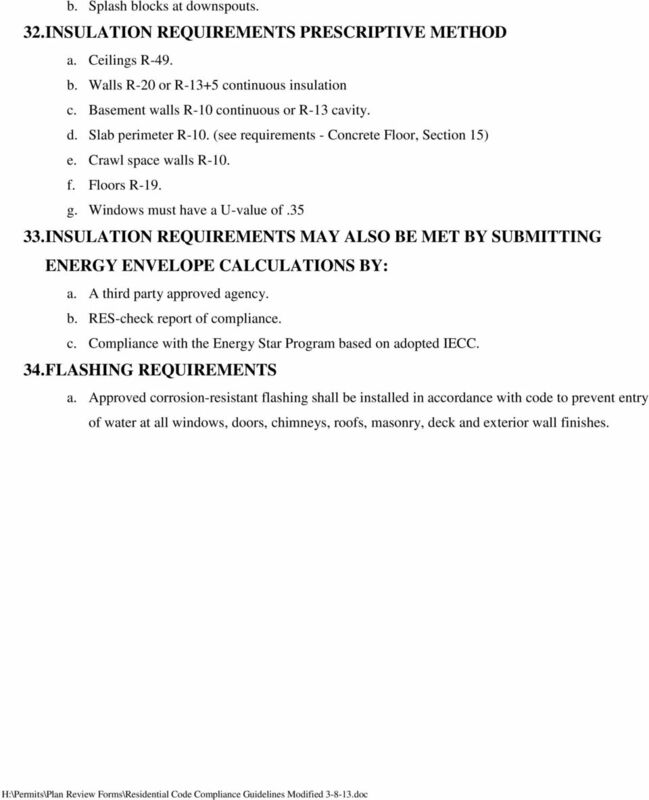 10 e. Alarms in alterations, repairs, or additions are not required to be interconnected unless remodeling required removal of the wall and ceiling covering. f. Smoke alarms shall receive their primary power from the building wiring of a commercial source and shall receive backup power from a battery. g. Carbon monoxide alarms outside each bedroom in units with fuel-fired appliances/attached garages. 28. KITCHEN VENTILATION AND CLOTHES DRYER EXHAUST a. Vent systems shall be independent of all other systems and shall convey the moisture to the outdoors. b. Vents shall not be connected with sheet-metal screws or fastening means which extend into the vent. c. Exhaust vents shall be equipped with a back draft damper. d. Vents shall be constructed of rigid metal ducts having smooth interior surfaces with joints running in the direction of air flow. e. Flexible duct connections shall not be concealed within construction. f. Vent size shall be at least the diameter of the appliance outlet. 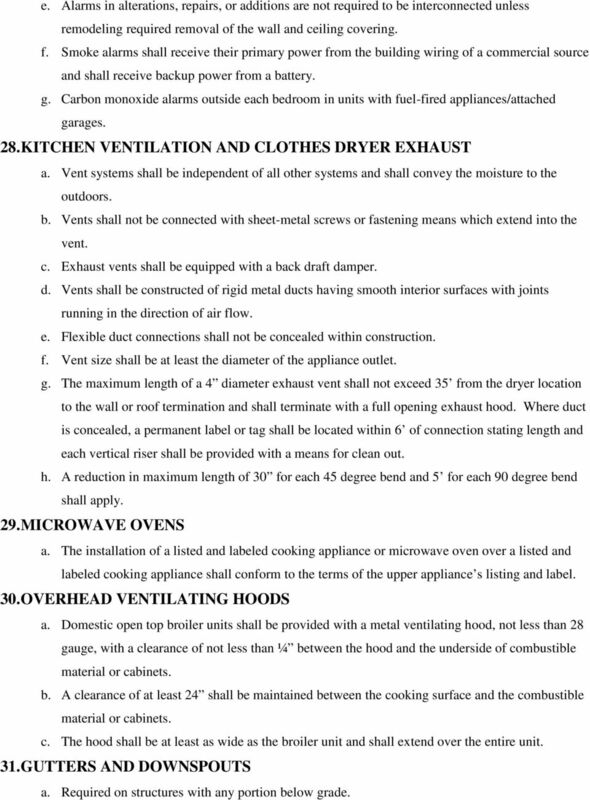 g. The maximum length of a 4 diameter exhaust vent shall not exceed 35 from the dryer location to the wall or roof termination and shall terminate with a full opening exhaust hood. Where duct is concealed, a permanent label or tag shall be located within 6 of connection stating length and each vertical riser shall be provided with a means for clean out. h. A reduction in maximum length of 30 for each 45 degree bend and 5 for each 90 degree bend shall apply. 29. MICROWAVE OVENS a. The installation of a listed and labeled cooking appliance or microwave oven over a listed and labeled cooking appliance shall conform to the terms of the upper appliance s listing and label. 30. OVERHEAD VENTILATING HOODS a. Domestic open top broiler units shall be provided with a metal ventilating hood, not less than 28 gauge, with a clearance of not less than ¼ between the hood and the underside of combustible material or cabinets. b. A clearance of at least 24 shall be maintained between the cooking surface and the combustible material or cabinets. c. The hood shall be at least as wide as the broiler unit and shall extend over the entire unit. 31. GUTTERS AND DOWNSPOUTS a. Required on structures with any portion below grade. 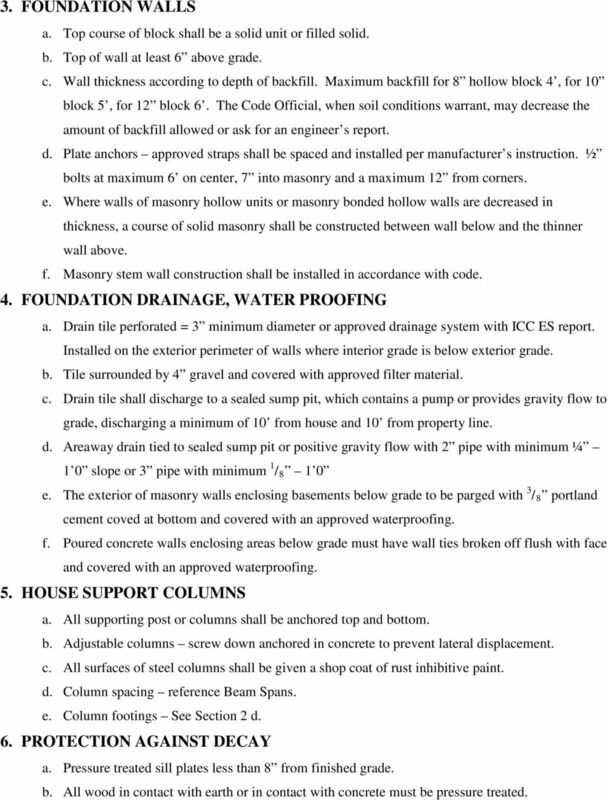 CALIFORNIA BUILDING CODE NONSTRUCTURAL DESIGN REQUIREMENTS This section contains portions of the California Building Code which relate to basic minimum nonstructural design requirements for a residence.